An incredible recapture 21 years later! When Charlotte resident Andy Ball headed to the South Carolina coast for a summer escape, he caught a red drum that was tagged 21 years ago. 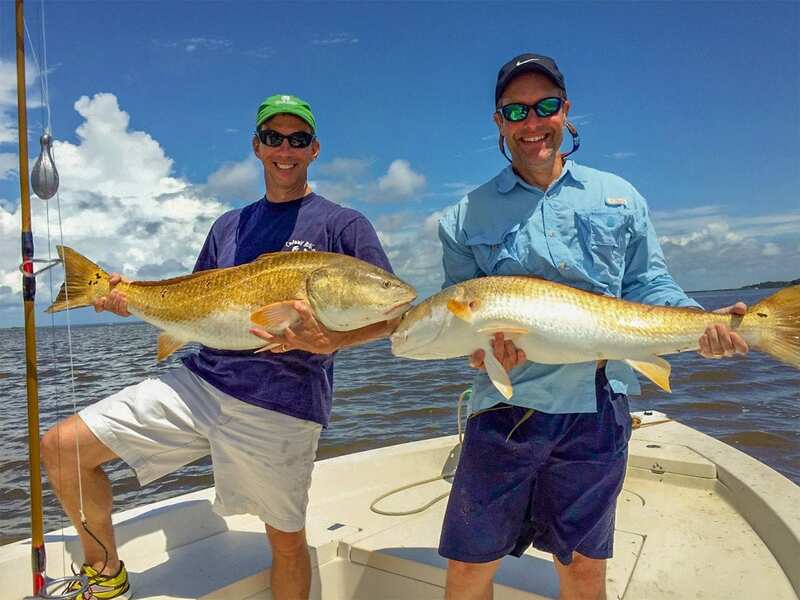 Friends Andy Ball and Brent Milgrom pose with two large red drum they caught at the Winyah jetties. Since the 1970s, SCDNR biologists have operated a volunteer tagging program whereby recreational anglers can turn their fishing trips into valuable scientific information by tagging the fish they catch and release. Using a specialized tagging device, researchers and anglers insert the tag into the muscle of a fish by the dorsal fin. Harmless to the fish, the tags can remain anchored there for decades as the fish grows. Andy Ball contacted SCDNR’s tagging coordinator, Morgan Hart, to report the tag number and details of the red drum he’d recaptured. Every time a tagged fish is reported, Hart sends detailed updates about the fish’s history to both the original taggers and the recapturers. It’s a neat way to see where a particular fish has traveled since you last saw it. When Hart ran the fish’s history, she was amazed. It had been tagged over 21 years prior. “I could tell right away that the tag report was special,” Hart said. “The tag number was different than anything I had seen recaptured before. Once I realized how long ago it was tagged, I think my mouth literally fell open. When Mischke caught it, the red drum was already a mature fish at 35 inches—meaning it is now likely to be well older than 21 years of age. SCDNR research has shown red drum are impressively long-lived fish, with biologists documenting fish up to 40 years old. A decade later, redfish ‘A033559’ showed up once again in the records, when angler Warren Wood caught and measured the fish in 2008. By this time, the red drum had grown five inches and migrated to Georgetown, where Wood reported catching it off the Winyah Bay jetties. And that’s exactly where Andy Ball caught the fish this summer – no larger this time, but another decade older.